Born in Jerusalem, Israel, Barkai is a graduate of the School of Visual Arts’ Photography Department, and lives and works in New York City. She spent her military service in the Israeli Defense Forces as a military photographer for the IDF Official Magazine, ‘BaMachaneh’. Her photographs have been exhibited worldwide, and she is the recipient of the National Press Photographers Foundation Grant. Barkai’s work was included in the Sony World Photography Awards, Quest and W Magazines, the Dancing Bear Collection, the George Eastman House Photography Museum, and the Tel Aviv Museum of Art. Public Art installations include Walking Men 99™ in Downtown Manhattan (2010-2013), which was commissioned by the Alliance for Downtown New York as part of the Re:Construction Program, and followed by a series of installations including Walking Men PERMM (2010), a public art installation in collaboration with the PERMM Museum of Contemporary Art in Russia, The Banner Gallery as part of the Art & About Festival in Sydney (2013) and in conjunction with Walk 21 Sydney, Australia (2014), and most recently Walking Men Buenos Aires (2015). Additional projects include Men At Work (2010), which was on display at the Bat-Yam International Biennial of Landscape Urbanism in Israel, followed by the installation of Men At Work NYC (2011-2012), which wrapped around the construction of 4 World Trade Center (Re:Construction Program in collaboration with Silverstein Properties). Barkai’s work has been featured in The New York Times, The Wall Street Journal, NY Daily News, and The Telegraph, among others. 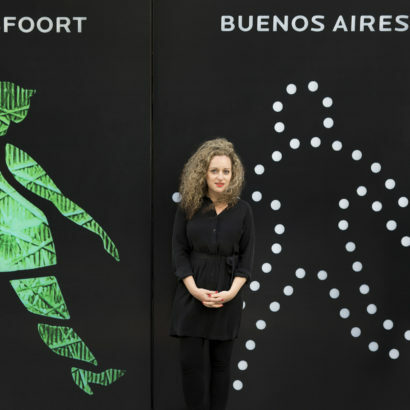 She has been invited to speak on panels and artist talks locally and internationally, among which at the AIA Center for Architecture, the Art Gallery of New South Wales, the PERMM Museum of Contemporary Art, and the University of Buenos Aires. © 2019 Walking Men Worldwide™ by Maya Barkai © Maya Barkai 2004–2018. All Rights Reserved. This Website contains trademarks of Maya Barkai in the United States and other countries. Other trademarks are of their respective owners.